True change is coming to New York’s streetscape. Not rhetorical speech change, but the kind of change that inspires real political citizenship, participation and a new belief in the street as the ultimate stage for public life. Over the course of three weeks last Spring, planters, bollards and stone slab benches were placed on a large swath of Belgian block pavement in the heart of New York’s Meatpacking district. Gansevoort Plaza, until then a chaotic confluence of four streets, was transformed into a pleasant pedestrian square almost overnight—in urban terms, that is. The sudden appearance of this new public space was no guerilla maneuver. It is the first installment of World Class Streets, an ambitious plan to rethink and redesign New York’s streetscape. It’s also part of PlaNYC, Mayor Bloomberg’s comprehensive sustainability plan, and Sustainable Streets, New York’s Department of Transportation (NYCDOT) strategic plan. But unlike other grand plans of the past—led by ‘absolute rulers’ such as Paris’ Baron Haussman or New York’s own bête noire, Robert Moses—this revolutionary blueprint is not the brainchild of Mayor Bloomberg, or even of New York City Commissioner of Transportation Janette Sadik-Khan alone. It is rather the result of a all-inclusive process, grounded in extensive citizen participation and developed in collaboration with urban advocacy groups such as the nonprofit organization Project for Public Spaces. City officials are also getting out of their offices and studying pedestrian-friendly cities such as Melbourne or Barcelona, in order to find out what makes their streets so successful. And they even hired Jan Gehl, the Danish architect who put the ‘world class’ in Copenhagen’s walking and cycling streets. 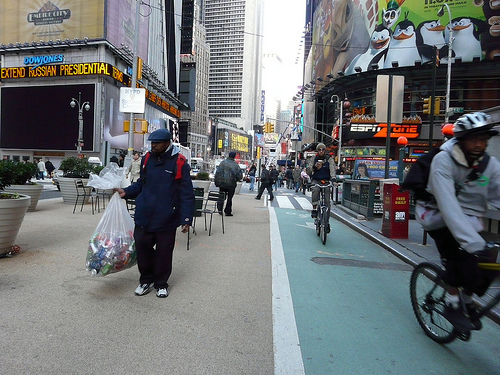 to survey and diagnose New York’s over-congested city traffic lanes and sidewalks. New Yorkers may not have seen Gehl’s report, but they’ve definitely started to see the results of his suggestions popping up in the city’s five boroughs. Impromptu outdoor terraces have sprung up in places like Madison Square Park and Times Square, dedicated bus lanes and bike routes are being implemented and many of the city’s arteries—such as Park Avenue and Brooklyn’s Montague Street—have been temporarily closed to cars and opened to strollers, skaters, joggers, samba dancers and the like. And guess what? It’s all free for citizens to enjoy. In our supercharged era of change, these pop-up plazas and street parks are not just declarations of intent. They are physical political statements, tangible signs of change not only on the city’s streets, but also in the decision-making behind city planning. Much like any other democratic process, urban design must be seen as an open-ended, debatable, evolving course of action, not as a top-down set of rules for city living. Such is the case of Gansevoort Plaza’s new design: on January 13th, city officials met with around 100 local residents and businesses in a public forum to reexamine and discuss the effects of the square’s makeover. Having taken note of the design’s strengths (increased walking safety), and weaknesses (higher traffic congestion), NYCDOT will implement changes to the initial square configuration in the project’s permanent design phase. This means all the creative, flexible adjustments to the streetscape being proposed by the city of New York are not necessarily set in stone. And that’s good news too, for changing your mind is also part of good governance. The city of New York is returning its public spaces to their rightful owners: the people. But the most fascinating aspect behind the ‘World Class Streets’ program is that it proves successful urban design is not just about the strategy, but about the tactics. Likewise, ‘world class’ streets and cities are not just shaped by legislation, bureaucracy and heavy machinery, they are tangible interpretations of the needs and aspirations of citizens by their rulers at a given time. These forward-thinking measures from our current New York leaders mean this city is not only breaking new ground in street planning, it’s also leading the world in participatory city-making. This article was the first assignment for Justin Davidson‘s part of the Criticism Lab course. Held as a professional writing workshop, Davidson’s class focused on “journalistic criticism [as] a more collaborative effort than a one-name byline implies”. Therefore, students reproduced the process by which a piece of writing gets into print by editing each other. We were divided up into groups of three, and each member wrote one story, edit a second and fact-check/copy-edit a third, in round-robin fashion.This was a great learning experience, and I had great late-night fun with co-“team late” members Laura Forde and Jim Wegener. For this assignment, titled “Remaking New York’s streets”, we were asked to download and read “World Class Streets,” from the NYC Department of Transportation website (nyc.gov/dot) and watch the following brief two film clips: this one and this one. We were then asked to write a 600-word opinionated report on the initiatives undertaken by the DOT and its commissioner Janette Sadik-Khan to make the streets friendlier to pedestrians and cyclists. Laura was the editor and Jim was copy editor of this piece.